Service will be interrupted this weekend on the Red, Orange and Green lines beginning at 10 p.m. Friday. Metro workers will spend the weekend installing new rail, ties, platforms, escalators, signals, lighting and communication systems on three lines. Service will be interrupted on the Red, Orange and Green lines beginning at 10 p.m. Friday. The rebuilding work follows, but is not related to, a fire on a Metro train Tuesday. Metro says the fire at the Silver Spring station may have been started by a loose part striking a power cable. The transit agency said the root cause of Tuesday's fire is still under investigation. Metro says the rail car was part of the 1000 series, one of the oldest types of railcar Metro operates, and hoses and cables all 1000 series cars will be inspected by the end of the week. Free shuttle buses will replace trains between Greenbelt and West Hyattsville. The Greenbelt, College Park and Prince George's Plaza will be closed. Those planning to take the Metro to the graduation ceremony at University of Maryland - College Park may want to make adjustments to accommodate any delays they may encounter. Trains will single track between Van Ness and Dupont Circle and between Rhode Island Ave and Takoma. Red Line trains will operate every 24 minutes between Shady Grove and Glenmont. 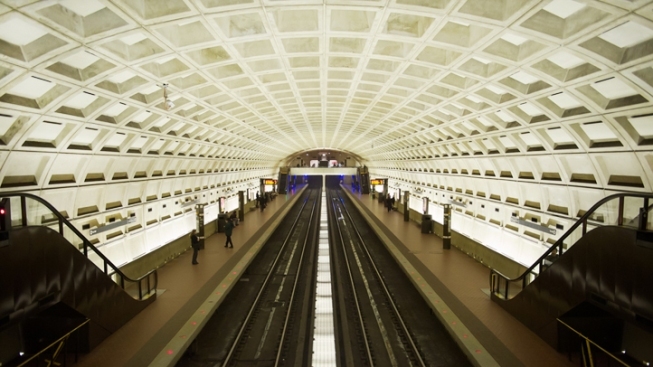 Additional trains will operate between Dupont Circle and NoMa-Gallaudet. Free shuttle buses will replace trains between East Falls Church and Clarendon. Shuttle buses will operate continuously between the stations. The Ballston and Virginia Square stations will be closed. The Blue and Yellow lines will not be affected. Normal service will resume Monday morning.